I took some pictures at an Opportunity Knocks event several weeks ago and met Eric’s partner there. We exchanged information and made some plans to meet for this project, but it turned out that the timing was better to meet with Eric first, so here we are. Eric invited me to his tipi outside of Sisters, making this a first for the project. We sat sheltered in there, kept warm by a fire, while birds chirped a winter song and light rain drizzled down outside. His thoughtful and deliberate answers combined with our being in his element made for a truly powerful conversation. It is a lovely and rare occasion to meet a man who is capable and smart and powerful while simultaneously being humbly aware of his struggles and determined to do better. Well, I guess you'd call me a seeker and one who is interested in unearthing the beautiful aspects of humanity in myself and others. And I find the best tools to do that through ancient indigenous spirituality and practices. And so I deepen those in myself and anyone who wants to walk those paths. 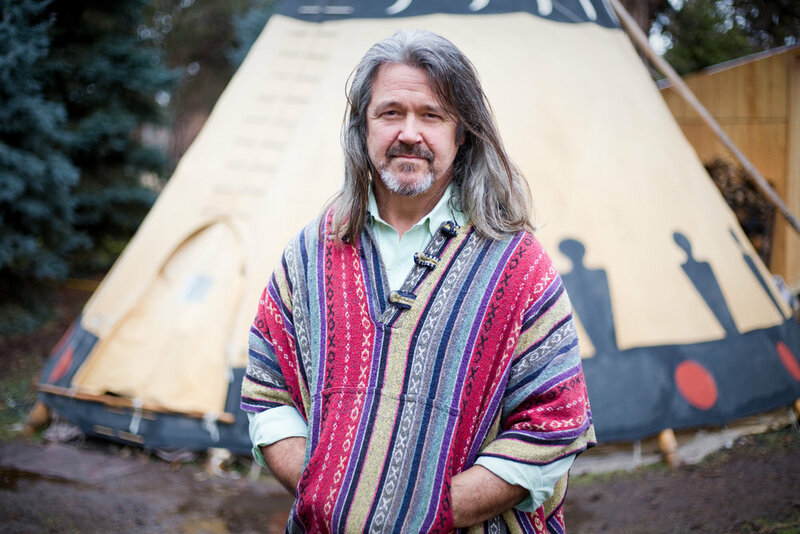 Where do you come from and what brings us to be sitting in a tipi together? I was raised in Salem. Moved to Bend in 2004. I loved it - been driving through this area for most of my life because we have a hunting cabin in Rome, Oregon, which is about four hours southeast of here. So I've been driving through Bend forever. I've always loved this climate. And I've never felt at home in a place more than Bend. I went through some big life changes in 2008. Had a big ol' house. I'd been reading some books on alternative ways of living and had been doing that for a number of years. Had become fascinated with Native American culture in the 1990s and so I had read a lot of books about that. And then when my spiritual path changed from Mormonism, it seemed a natural step to just get a tipi and go live on land. And so I had a friend that's a surgeon - I built a cabin for him on a couple hundred acres west of Sisters and I took him out to dinner one night (laughs) and said, Hey, can I put a tipi on your land? And he's like, Absolutely! So, I did. I lived in a tipi out there and I really loved it. And it's become my preferred mode of living. And so I want to either live in a tipi or I'd probably go to a yurt if necessary, but I'm hoping to keep it in the tipi. So, yeah, it's just a preferred mode of living now. I think this life is an absolute blast - in one way in particular and that is just this continued interaction between my own ego - the things I think I want - and the things that sustain me in a consciousness way. And I find that they're often at odds and sometimes they're not at odds. So that whole interplay between what is necessary to sustain my life and what is extra and why I think I want that - whatever that may be, like a mountain bike or a different car. What is it about our life in western culture that engages me so much and engages other people so much? And how can I release what doesn't need to be there and what's not helpful and embrace what is helpful? That's interesting to me. The nature of our life - of human life - is an exploration to me. It's like an experiment that will last as long as I am here. So I guess that's what keeps me going. A new day is gonna bring some new thing for me to kind of take a look at and do an experiment and see what part of my conscious self can engage that and what is more than necessary - and so much so that it becomes unhelpful. (Laughs) I don't know how you're gonna make that work in an article! What does community mean to you and how does that play into your quest? I thought about that a lot. I lived on my own - the first round with the tipi was on my own pretty much. I think that that was necessary to an extent, but too much. Like so much in our lives, too much can be unhealthy. I've considered doing the hermit thing. Seriously. And just going out - way out - and living off the land, trying my hand at that. The whole nine yards. And I think that it's okay. I've come to appreciate that humans are generally social creatures. I do think that there's a pack mentality that's okay in most, or at least many, circumstances. I'm on my path. If it interests anyone, then they're welcome. And that's about it. I'm happy to have as many people around that are interested in consciousness and deepening their joy in a conscious way as I can handle. I think that we feed off one another in a good way - we can feed off one another in a good way. And I love it when one plus one equals three. When there's like an extra piece there that's deeper. And I think that's part of what it means to be human is finding those moments. It's interesting, I think, that in order to show up for humanity that way, I need to spend quite a bit of time in solitude. In order to be my authentic self, I have to be away from people in order to bring my best self to people and to interact in a good, conscious way. As we do our own work, the kinds of communities we establish will be what makes or breaks humanity - whether or not we survive. So doing our own work and then being willing to engage in community of other people who are doing their work - is whether we make it or not. What's your role as an individual in the combat of social injustice? I do it in a couple different ways, I guess. I do my best to see it within myself. See what arises - what prejudices might arise. How I support a culture where that's endemic to it - it's an absolute part of it. The history of this nation is really built on social injustice. For all the rhetoric we get, the fact is that there were thriving cultures here that were starved or bulleted - just shot into submission. That has weighed heavily on me. I can't change the past. I can only change the way I interact with the results of it. This is part of the reason I live in a tipi. I don't see it as healthy for me, for my soul, to be tied to one place paying a mortgage for 30 years with a whole bunch of interest that will be spent on things I don't believe in. So I live the best I can. I can't change the past. And I've aligned myself with a family - a Native American group we call a tiyospaye, that's a Lakota word for a clan - and we do ceremony together. And I support my Native brothers and sisters in their struggles. And in so doing, I work on my own struggles. In ceremony and in Native American spiritual practices - in sun dance and in sweat lodges and in work parties around those things. That pretty much defines my year every year - the sun dance that happens in July. Our lives revolved around that ceremony with the Native people. That's part of it. I mean, I guess the biggest part is, again, see what I need and see what I want and make a choice. Sometimes it makes sense to get a new car and sometimes it makes sense to fix what I got and live in a more sustainable way. Peace. Yeah. In a word, peace. And I don't mean that in some kind of a beauty contestant way. I mean real inner peace that will bring peace to community and peace to the world. I see what's happening in the world - the constant war. This nation's been at war the whole of its existence with very few exceptions. I see that as a result of inner turmoil, inner conflict. So doing my own work so that I can feel at peace and then doing what I can to bring that peace into the world - I think that's worthy work for the rest of my life. And it will probably take that long (laughs). I guess that it's. I want to see more peace in myself and others and in the world. Do you have anything else that you want to put out there? To anyone who listens to this interview or reads your transcription, know that you are way more than you think. Know that you're loved in a deep way - in ways that we don't understand. And that whatever gifts you have, we need. So bring 'em. Bring your gifts. Go get 'em. Find 'em. Uncover 'em. Get away from distraction long enough to uncover your gifts and then bring those suckers into the world.